Skin Balancing Ultra-Sheer Daily Defense Broad Spectrum SPF 30 offers multiple anti-aging benefits for combination to oily skin. The silky, sheer formula provides broad-spectrum sun protection to prevent and reduce wrinkles and brown spots. It's loaded with potent antioxidants and cell-communicating ingredients proven to help your skin look and act younger while minimizing oil and smoothing dryness. Your skin will feel soft and have a fresh matte finish. With daily use complexion becomes younger-looking and healthier. Perfect to wear under makeup. Apply liberally before sun exposure as the last step in your morning skin-care routine. Allow a moment to dry before applying makeup. 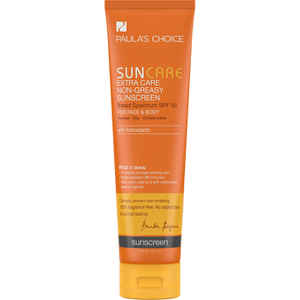 For extra sun protection and to create a flawless finish, follow with a Paula's Choice foundation and pressed powder with sunscreen. Active Ingredients: Oxybenzone 4%; Avobenzone 3%; Homosalate 7%; and Octocrylene 2%. Other Ingredients: Water, Butylene Glycol, Silica, Camellia Sinensis (Green Tea) Leaf Extract, Aloe Barbadensis Leaf Juice Powder, Ascorbyl Palmitate, Phospholipids, Superoxide Dismutase, Adenosine, Tocopherol, Bisabolol, Boerhavia Diffusa Root Extract, Colloidal Oatmeal, Panthenol, Ginkgo Biloba Leaf Extract, Salix Alba (Willow) Bark Extract, Cetyl Dimethicone, Aluminum Starch Octenylsuccinate, Acrylates/C10-30 Alkyl Acrylate Crosspolymer, Titanium Dioxide, Sorbic Acid, Sodium Hydroxide, Steareth-21, Steareth-2, Polysorbate-20, Disodium EDTA, Phenoxyethanol. My face breaks out to sunscreens with SPF. I've tried most of over the counter brands and mid-expensive brands. I gave this one a chance; however, unfortunately, it did not work for me like most other products. I would not say this product is poor or has a problem, as it is lightweight and smooth with a little bit of greasiness. It is fairly good for the price! This moisturizer is the best for oily/acne prone skin. This is the only product that I have used that doesn't clog my pores, moisturizers and keeps my skin from breaking out and being to oily. I love this product and the value is great! !